This report describes three possible scenarios for wind energy capacity installations in 2030 based on WindEurope’s analysis of the potential conditions determining wind energy deployment post-2020. According to WindEurope’s Central Scenario, 323 GW of cumulative wind energy capacity would be installed in the EU by 2030, 253 GW onshore and 70 GW offshore. That would be more than double the capacity installed at the end of 2016 (160 GW). With this capacity, wind energy would produce 888 TWh of electricity, equivalent to 30% of the EU’s power demand. 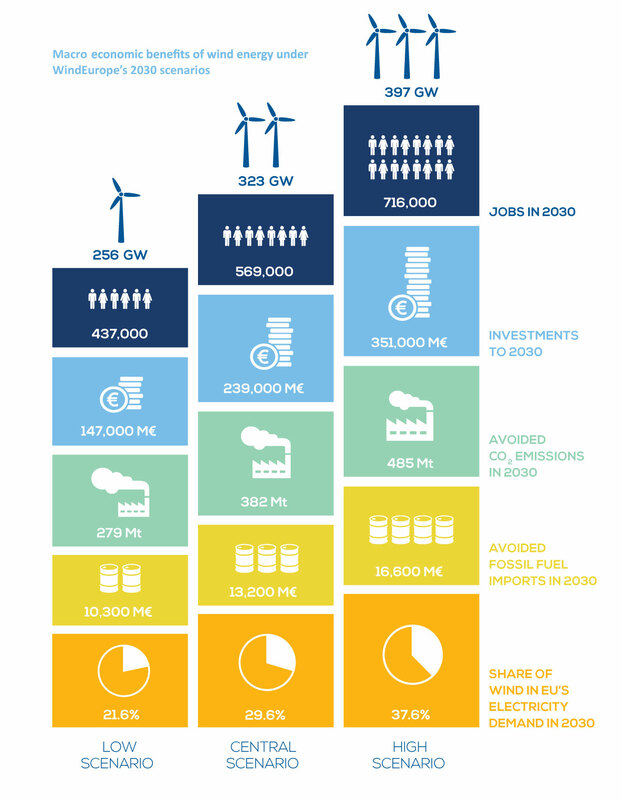 The wind energy industry would invest €239 bn by 2030 and provide employment to 569,000 people. The report highlights the social and economic impacts of each scenario and recommends the policy and other measures required to deploy wind energy with a view to sustaining Europe’s technological leadership in wind.